For the last 3 years I’ve lived in my GoWalk Sketchers as we travelled the world. It took me over a decade to find shoes I wanted to live in, and I was content. My Sketchers are now in the bin. After one month wearing my brand new Zee Alexis shoes, I can confidently say I am hooked. And now I have 3 pairs. Shopping tip: Click here to save 20% on Zee Alexis shoes with our unique coupon code. Let’s start with my favourite. These shoes have replaced my Sketchers for day-to-day wear. They offer foot-hugging support with memory foam insole and a durable rubber sole. But most importantly, are extremely lightweight and flexible. My favoured part of the shoe, and what really sets them apart from other sneakers, is the upper woven elastic. It makes the shoe feel like a glove. This gives a super comfortable fit with no slipping or sliding. Very important when I’m out and about every day. They look glam-tastic with anything - jeans or shorts. And the funky, playful design still gives a professional image when informal meetings come up. I’ve worn them on day-long tours, walking around big cities, visiting theme parks, and out to dinner. I have to say they are the comfiest shoe I’ve worn in a long time. 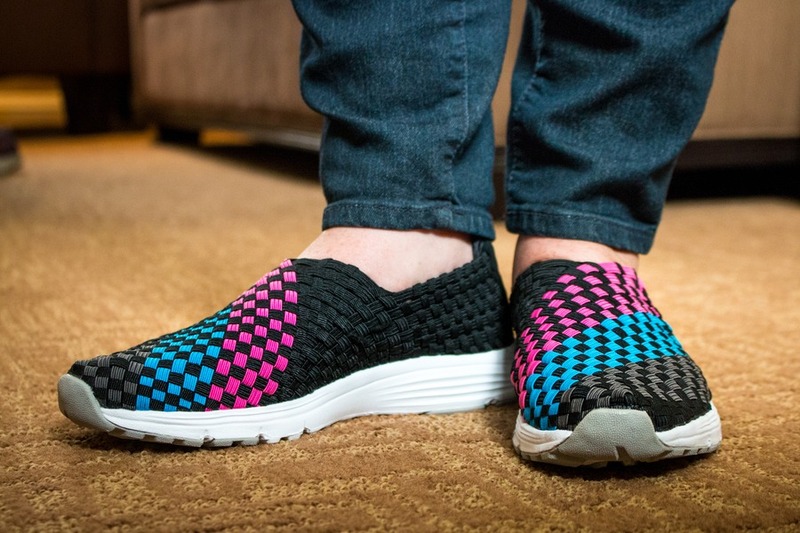 The woven elastic design makes the sneaker breathable so your feet don’t sweat. But that is also the only set back I experienced. One day my socks got damp after walking through long dewy grass. I didn’t expect them to be waterproof, but at the same time I wouldn’t suggest walking in deep puddles or standing in the rain for extended periods. Common sense, really. I choose these shoes as an alternative dress-up sneaker to wear out to elegant dinners. They are not quite as comfortable as my LINDA, but they certainly are classier with the glitter streak though the weave. Since injuring my big toe a few years back, I find anything other than sneakers eventually causes strain and discomfort. 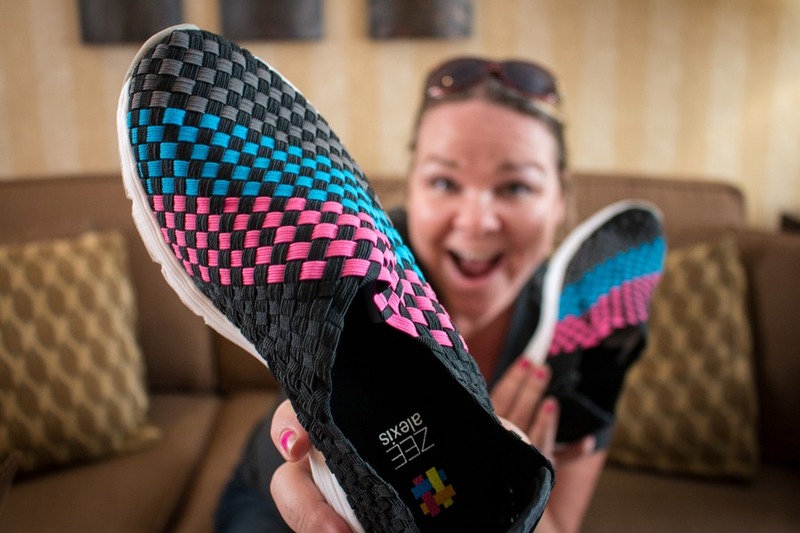 So the DANIELLE is a perfect compromise between snazzy style and sneaker-style comfort. 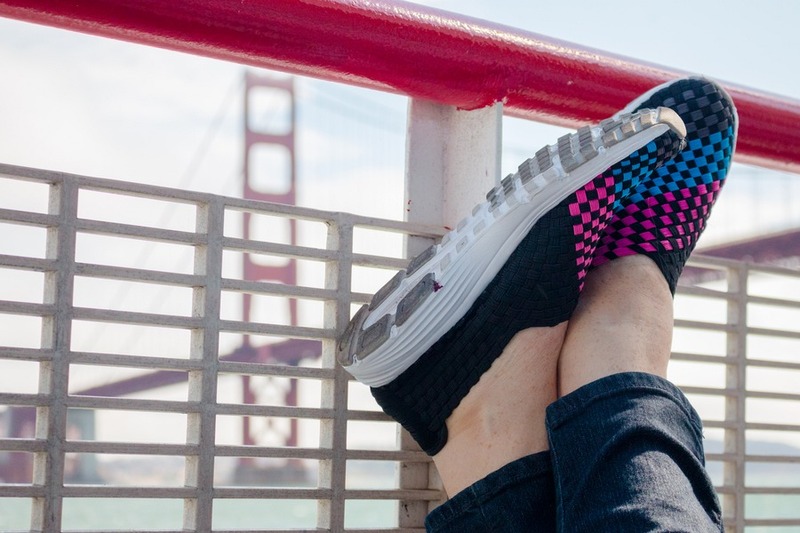 It’s got the same upper woven elastics, memory foam insole and lightweight construction as the LINDA. So I can wear it out all day on a food tour in complete comfort, but still look stylish for an evening out with friends later. Hold your horses, my American friends, a “thong” might mean something different to you, but I am talking about a pretty, little sandal. 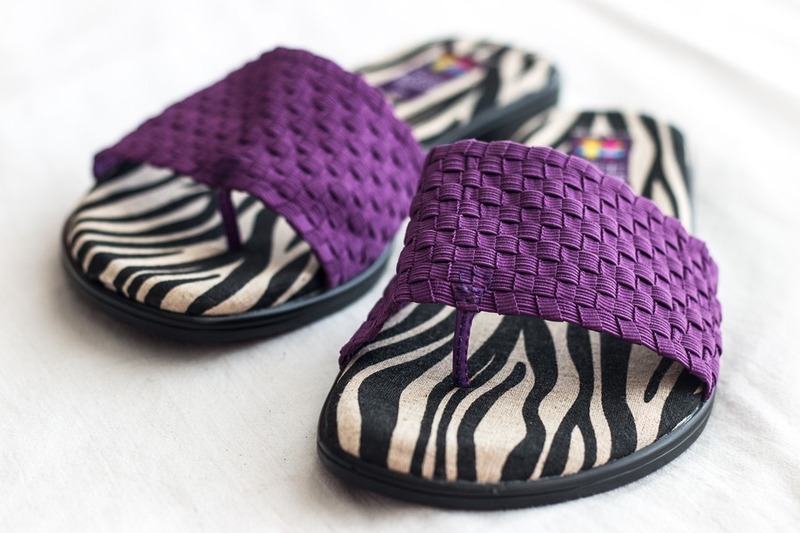 This sandal is a dream come true since it has the same comfortable memory foam insole as the sneakers above. But also perfect for wearing to the beach, swimming pool or waterpark. Since I injured my toe some time back, I don’t wear thongs as often as I use to. To that extent I was excited to find an open shoe that provided both walking-on-cloud comfort and satisfied my fetish for safari-inspired patterns. This is a clean sweep. No need to tally the results. Goodbye Sketchers. Goodbye rubber thongs (flip-flops). And hello Zee Alexis, my new favourite walking shoe. For years I could not bring myself to spend money on a good pair of shoes. Until we moved to New York and I walked everywhere. I discovered Ecco slip on shoes. My first pair lasted almost 10 years and went through many trips. They were still almost perfect but they were a little beaten up. I now use them to walk the dog, and I have a new second pair that I love. Bernie Mev's offer a dressier style to this shoe, same comfort prettier styles! I wear them as a teacher all the time! How are they on rainy days?